When I saw this book was being reprinted I got terribly excited. 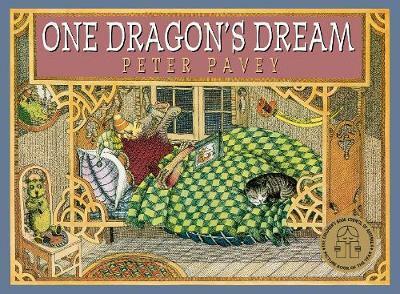 One Dragon’s Dream is the first book I remember and I was obsessed with its intricate, beautiful illustrations. Basically a counting book, the story revolves around the strange world of the dragon’s dream. But each page also holds a fascinating ‘look and find’, as each page has the same number of objects as the number it corresponds to. For example, on the number two page, there are two umbrellas, two ducks, two platypuses and it’s up to us to find them! This book is exactly what children’s books should be: chaotic, challenging and absorbing.